César Estrada Chávez (March 31, 1927 – April 23, 1993) founded the National Farm Workers Association that later became the United Farm Workers. Chávez was born near Yuma, Arizona. He became a migrant farm worker at age 10, with the rest of his family, when they lost their farm during The Great Depression. He attended over 30 schools, but ended his formal education with the eighth grade. He joined the U.S. Navy in 1946 and served in the western Pacific. While on leave he sat in the white section of a racially segregated movie theater and refused to move, forshadowing his future exploits. After service, he returned to central California and married Helen Fabela. He began working as a organizer in 1952, working for the Community Services Organization, a Latino civil rights group. He became their national director in the late 1950s, but resigned in 1962 to form the National Farm Workers Association, which became the United Farm Workers. He was trained in organizing by Fred Ross, himself a student of Saul Alinsky. In 1965, Chávez and the NFWA led a strike of California grape-pickers in demand of higher wages, along with a national boycott of California table grapes, which, five years later resulted in the first major victory for US migrant workers. He continued to struggle against large growers, including going on three hunger strikes over wages and conditions. At the time of his death he was leading another grape boycott to protest the use of harmful pesticides. 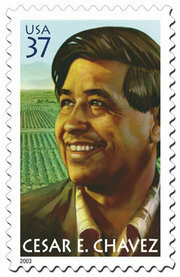 He became an American labor rights hero for supporting labor rights for Mexican migrant farm workers. Chávez was also a vegetarian. Chávez is celebrated in California where the state legislature, in 2000, approved a bill to create a paid state holiday in his honor. The holiday is celebrated on March 31st, Chávez's birthday. Texas also recognizes the day, and in Arizona and Colorado it is an optional holiday. The holiday is the first in the history of the United States for a Mexican American and a labor leader. Many cities have also paid respect by renaming streets or schools for him. These cities include San Francisco (San Francisco USD), Los Angeles (Los Angeles USD), Santa Barbara, Houston, Texas (Houston ISD), Albuquerque, New Mexico, Austin, Texas, Milwaukee, Wisconsin, Washington, DC, Kansas City, Missouri, Saint Paul, Minnesota, Salt Lake City, and Phoenix, Arizona. The California cities of Sacramento, San Diego, Berkeley, and San Jose have also renamed parks in his memory. The United States Postal Service honored him with a postage stamp in 2004. Colegio César Chávez was the only four year Chicano college in the United States with accredation status. Colegio was headquartered in Mount Angel, Oregon. It opened its doors in 1973 and closed in 1983. César Chávez himself visited the campus twice, taking part in attempts to save the college from closure.